All your Bikini Bottom favorites are back in this fun guessing game, Spongebob Mastermind Towers. In this interesting Spongebob game, each of the two players have a plastic tower in which they arrange tiles that feature the main characters of the popular kids television show, Spongebob Squarepants. Then they take turns guessing their opponent’s tile order by asking yes or no questions and placing matching cardboard tiles in order until they figure out the sequence. The object of the game is simple: guess the order of your opponent’s characters before they guess yours. 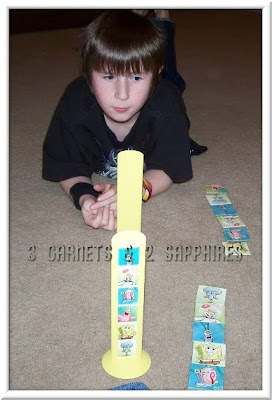 The game requires memory, math, and reasoning skills, location placement abilities, and patience. All of us really enjoyed playing this game. Even my 3 year old, Quinn, got involved, though some of the logic behind the game was a little complex for him. My 9 year old, Avery, really enjoyed this game and can’t wait to play it with his friends. I like that it’s simple to explain and easy to assemble and disassemble quickly. It’s geared toward children and adults age 6 and up, but it’s sure to entertain the whole family. 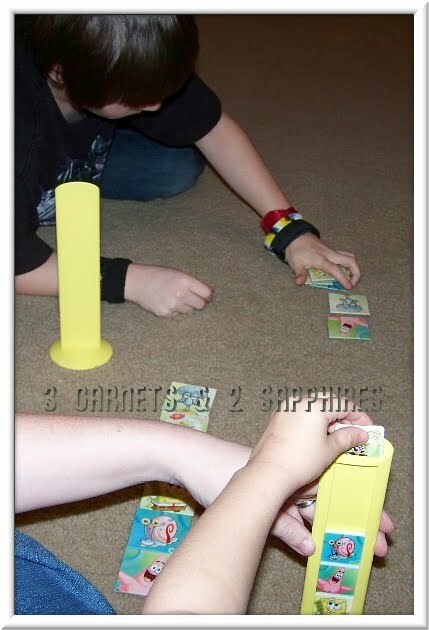 Overall we found this game to be fun, unique, and good quality entertainment for our family game nights. 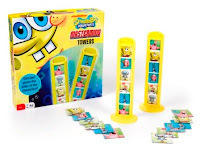 Spongebob Mastermind Towers would make a great Christmas gift for any Spongebob-lover older than six years old. It retails for $14.99 and can be purchased at most major retailers, including Amazon.com and the Pressman Store. Thank you to Pressman for sending us a complimentary product sample to base this review upon and for providing a second product for our contest prize. One lucky reader will receive the Spongebob Mastermind Towers game. Browse the selection of board games offered in the Pressman Store. Then leave a comment telling me the name of at least one game you would like to own or give as a gift (aside from the game reviewed in this article). You MUST do this to be eligible to win this contest. 3) For 10 extra entries, blog about this contest linking back to this post AND PressmanToy.com . Then come back here and leave TEN separate comments with the link to your blog post. 5) For 1 extra entry each, follow Pressman on Twitter and/or "Like" Pressman Toy Corp on Facebook. Then leave a separate comment for each with the link to your Twitter or Facebook profile. This contest will be closed on Monday, December 13th, 2010 at 11:59pm EST. A random number drawing will be held shortly after. The winner will be announced here and will be contact via email or through their blog. If the winner does not respond within 48 hours, a new number will be drawn.